Cary T. Grayson describes how President Woodrow Wilson made a sudden trip to Philadelphia to see his latest grandchild, Eleanor Axson Sayre, who was born on 26 March 1916. I have just returned from Philadelphia—This morning about eleven o’clock Hoover called me in wild excitement saying that the President had decided to go to Philadelphia at 12.40 to see Mrs. Sayre and the baby. The Sayres are returning to Williamstownto-morrow morning. We arrived at 4.55 and left at 5.15, and I was in the hospital every minute and could not phone you except in the presence of others—and—you know what a failure I am talking to you over the telephone, especially when any one is listening. In a few minutes after arriving at the Jefferson Hospital, the President talked with Mrs. Sayre—and Dr. Davis wanted to—and did show, Miss Edith and I over the hospital. We were there just one hour—Miss Edithwrote to you to-day. Why not come here Tuesday afternoon. Then we can decide definitely all our plans. The President goes to Princeton Tuesday morning to register in the primaries. Miss Edith is going, of course, and I have an idea it would be fine for you to join us at Princeton, Junction. The President’s car is hitched on the regular train at Princeton Junction about two p.M. You could be on that train and come back in the President’s car, there. However, I will let you know all details and the advisability about this Sunday night or early Monday morning by telephone. I am strong for seeing you Tuesday and settling all the questions that are uppermost in our minds and hearts these days. Miss Edith is very anxious for the wedding to be here, and I favor your seeing her before we decide definitely—but we must settle it Tuesday or—Wednesday sure. And you could write Mr. Cox from here. I am in favor of your going to Canada, if you can conveniently arrange to do so. I want you to have a good rest f before the great event—and whats is more, I think we are destined to spend the summer here in Washington. I am still in favor of the small wedding—but, of course, your wishes are first and most to be desired on my part. I am so glad you got a black dress. For you to have beautiful dresses, I am perfectly willing to go without lamb chops and other food & luxuries. I tried to pack up your silver tray (—and it’s handsome & beautiful)—and antique box—but I met with poor success. So I decided to keep them until you come as they would probably not reach you before you arrived here. I told Miss Julia how fond you were of antiques and how the box would please you. I, also, showed proper enthusiasm to Mrs. Meyer for the present from her—It is from Mr. & Mrs. Meyer. I am sending this special for fear it would not be delivered before Monday morning. It is raining hard and I have no means of transportation to the station at this hour of the night. 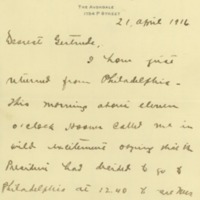 Grayson, Cary T. (Cary Travers), 1878-1938, “Cary T. Grayson to Alice Gertrude Gordon Grayson,” 1916 April 21, WWP20988, Cary T. Grayson Papers, Woodrow Wilson Presidential Library & Museum, Staunton, Virginia.